For the earlier Korean director of the same name, see Kim Ki-duk (director, born 1934). 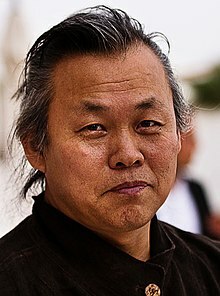 Kim Ki-duk (Hangul: 김기덕 Korean pronunciation: [kimɡidʌk]; born December 20, 1960) is a South Korean movie director and screenwriter. His movies have received many awards in the festival awards, making him one of the most important contemporary Asian movie directors. Major festival awards include Golden Lion at 69th Venice International Film Festival for Pietà, Silver Lion for Best Director at 61st Venice International Film Festival for 3-Iron, Silver Bear for Best Director at the 54th Berlin International Film Festival for Samaria and Un Certain Regard prize at 2011 Cannes Film Festival for Arirang. His most widely known feature is Spring, Summer, Fall, Winter... and Spring (2003), included in movie critic Roger Ebert's Great Movies. Two of his movies served as official submissions for Academy Award for Best Foreign Language Film as South Korean entries. Kim has given scripts to several of his former assistant directors including Juhn Jai-hong (Beautiful and Poongsan) and Jang Hoon (Rough Cut). ↑ "Profile of Kim Ki-deok" (in Korean). Cine21, The Hankyoreh. Retrieved 2007-11-24. Wikimedia Commons has media related to Kim Ki-duk. This page was last changed on 7 September 2017, at 22:37.